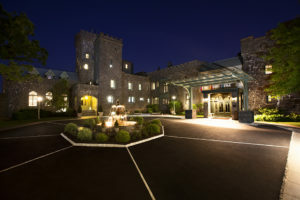 Castle Hotel & Spa (Tarrytown, NY), was named as one of the best honeymoon castles in the world! Hitched.co.uk released a list of castles perfect for a romantic vacation post-wedding. Castle Hotel & Spa was the only castle in the United States to make the list. Castle Hotel & Spa is the perfect location for a romantic vacation. Located just outside New York City, Castle Hotel & Spa boasts acres of lush gardens, tower suites featuring four-poster beds, wood-burning fireplaces, marble bathrooms, turret alcoves and breathtaking views of the hillside Palisades, the Hudson River and the New York skyline. Couples can enjoy a one-mile hiking/walking trail on the property, private/secret gardens (perfect for proposals), VIP couples massage lounge at THANN Sanctuary Spa, a private wine cellar, and an intimate dining experience with wood burning fireplaces at award-winning Equus restaurant.